Your dining room speaks volumes about your home. It’s the room in your home where you entertain company and serve your finest meals. Do you want to enjoy great Thanksgiving and Christmas dinners for years to come? If so, take the time to shop for the dining room sets that will make your home feel warm and valuable. Not sure where to start? Keep the following tips in mind while you’re shopping around. Without a doubt, your first step when putting together dining room sets should be to take measurements and handle logistics. When you know the size of the room you’re working with, it’s easier for you to choose the ideal pieces. As a rule of thumb, a 4-foot dining room table accommodates four guests. A 5-to-6-foot dining room table can seat upwards of six. You’ll also need to look at the base size of the table, in addition to the square footage of the room as a whole. Once you have all the correct measurements, it’ll be easier to make the best use of your space. You’ll also be in a better position to create a room that has flow. People who buy dining room sets tend to have brands they prefer more than others. When you decorate your living room, the possibilities are endless. You’ll have a lot of choices when it comes to buying things like dining room tables, china cabinets, and window dressings. Some popular furniture brands you might consider include Norwalk, Wesley Adams, and Saloom. You know you’re getting quality furniture pieces when you know the materials you’re buying. For instance, a dining room table might have a chic design with a firm metal base and glass table top. A china cabinet might be crafted with mahogany or other beautiful types of wood. There are also materials like bamboo that are environmentally friendly and beautiful. In terms of eco-friendliness, you also want to think about the lights you put into your brand new dining room. Using fluorescent lights not only creates ambiance in your dining room, but it also cuts the cost of energy use by 50%. 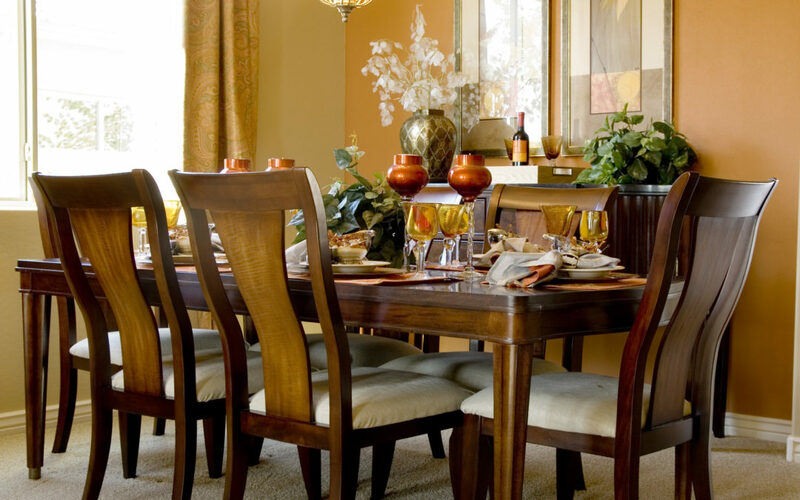 Your first substantial step toward buying a dining room set is to know how much money you’re willing to pay. It’s usually possible to get dining room sets for between $2,000 and $5,000. Of course, this price tag will depend on what you’re trying to get out of your dining room set and which company you shop with. Make sure to account for things like warranties and delivery costs so you can gather accurate estimates from furniture companies. Are you ready to purchase a new dining room set? We would love to hear from you. At Rainbow Furniture, we have a reputation for nothing but stellar furniture pieces. We know our inventory and will happily answer any questions that you may have. To buy a great dining room set, please contact us today for more information.